Earlier this month, Fire Emblem Heroes pushed out the 2.3.0 patch, bringing a number of tweaks to existing characters, new heroes, and new modes. Over the last couple of days, I had the chance to try out the two new modes pushed out this month and wanted to share my thoughts on the current build. It has been pretty quiet around here and over on the main site in regards to the game, so I’m partially gauging interest to see if anyone would be interested in seeing future articles like this one. Either way, let’s talk about it as this new patch introduces some interesting changes that I’m pretty excited about as a longtime player. Let’s start with the most exciting addition. Rival Domains is a new mode added to the Special Map rotation played on a larger map with a team composed of up to 20 units (referred in game as a Brigade). The goal in this mode is to overtake the enemy team’s Fortress. If you’ve played other Fire Emblem games, this is somewhat similar to Seize objectives where the map is cleared once one of your units takes over a specific map square. The difference here is you seize the objective by reducing the Fortress HP to zero. The current map in Rival Domains as of this writing from my phone. So here is where Rival Domains differs from Fire Emblem Heroes in general, as well as the traditional Seize maps in other games: Both teams start off with a Fortress and a Camp which include 4 additional tiles surrounding each. At the beginning of game, you start off with 8 active units and can warp back to your bases and any of the special squares with your color. Camps take about two hits to take over which opens more warp spaces for your army to utilize and quickly save some time reaching the enemy Fortress, as well as enable reinforcements to back up your other units. This becomes the key to reaching the Fortress as new enemies will spawn around the Fortress as your armies trade blows. If you take out four units in one turn, for example, four more will show up around the enemy fortress at start of the next turn. To win the game, the Fortress needs to be hit three times, regardless of how many enemy units are left. Both Brigades follow the same ruleset, meaning they can also warp to their camp spaces and your reinforcements will start showing up at your fortress as the enemy takes out your units. The caveat being the game ends when one fortress is taken down or after 10 turns, with a final score calculated on how far you got. What really makes Rival Domains stand out is the formation of your Brigade. In addition to using your own units, you can call upon your Friend’s list to “borrow” their current leader character to fill up your Brigade. Don’t have enough high level units to take into battle? Check your friend list and see if they have a character your Brigade is lacking. There are some restrictions though. No duplicate heroes are allowed and you are only permitted to bring in one unit with Sing or Dance which enables a unit to take another turn after their previous action. Units do not gain experience or SP in this mode, but you can try your hand as many times as you like as it does not cost any Stamina to play. With no penalty for dying as the next units are summoned in their place, you are encouraged to use your top units and your friend’s units to achieve victory. Even though I have an average number of powerful units, I found early on I didn’t have nearly enough 5 star heroes to make up my Brigade (not all of them are level 40 with maxed out skills). With that in mind, I took the opportunity to play with my friends special units that I don’t have. As fun as it is to play with eight of your units at a time, it is more fun to play with units you do not possess to try them out for the first time and experiment with their unique abilities. The units in green are my friend’s Heroes. Had to get creative with the order on the hardest difficulty. Looking at my friend’s available units, it is easy to compare what units you are currently missing to make up for that gap in your Brigade. Lacking any 5 star units with Dance/Sing, I immediately took advantage of the 5 star Azura and the New Year’s variant that was offered for a limited time earlier this year. This also gave me a chance to try out some of the other new units added on that are currently on my wish list to summon, including Hector (the Valentine’s Day variant), Ayra, and Eirika as a mounted mage, who was particularly valuable in clearing the Lunatic map on the first week. Take over the enemy camp. This prevents the enemy from warping in reinforcements and lets you warp your own reinforcements as they get summoned to replace fallen units. Consider who you bring in at the halfway point. You starting army will likely fall by the time you take over the enemy camp. Once they do, the next units can warp in to the new camp and either defend the camp and your party, or take out enemy units if they are in close range (you cannot move after you warp). Defend your Camps/Fortress! The enemy can still reclaim their fallen camp if they hit it twice. Place a unit over the camp to prevent an enemy from dealing damage to it. And finally, move to enemy warp squares and focus on dealing damage to the Fortress. By the late stages, if you are taking out units every turn, expect enemy reinforcements every turn. You can stop this from happening by placing a unit on their warp square. Remember, the game ends when a fortress is taken over or the 10 turn limit is reached! Rival Domains will not please everyone. Newer players might find it too difficult with their existing party or may not have as many friends to compensate for the lack of units, though the game supposedly will auto fill reinforcements for you if you lack the needed number of units to fill out your Brigade (I have not tested this). The randomness of what units the enemy team will summon may throw some people off, but with units continuously being traded out at a rapid pace, I found it to be an exciting change of pace and an excuse to put my strongest units into one huge party like the traditional Fire Emblem games do. My team above has the Water Blessing and can only enter the Garden of Water. Starting with the Book II story campaign added last year, Heroes introduced the concept of Legendary Heroes and Blessed Heroes. Legendary Heroes are unique heroes that automatically come equipped with one of four blessings (Fire, Water, Earth, and Wind). They gain double SP and buff units who have been blessed with their season’s element if it is active (two random elements go up each day). Blessed Heroes are existing units who have been equipped with an elemental Blessing of your choosing, provided you have the seals. Up until now, I’ve largely left my collection of Blessings untouched with no clue as to who should inherit them. This mode seems to have been created with that in mind. Blessed Gardens is a unique mode where only heroes equipped with a specific Blessing are permitted to enter, with each party of four not having any duplicate members. There are four Gardens or one for each element, which means you can only use heroes that have the applied Blessing for each Garden. You are given four Water Blessings to start off with, earning more as you play for the other elements. For those of you who haven’t used use your blessings, this requires special consideration to your party’s composition and balance as you don’t want a party of the same unit type (i.e. all swords, all reds, etc.) or you won’t be ready for each situation. A part of me dislikes the fact that you are limited to a small pool of your units, but having played the initial maps for the Garden of Water, I don’t think that will be an issue. So far, a balanced team of level 40 units should be able to complete the maps (I used Alfonse, Sharena, Anna, and Fjorm for the Water Garden). This comes with one downside though: the maps aren’t all that interesting. Using the preview map function added a while back, I took a peek at the other maps and noticed a pattern: All of the maps so far are variants of existing maps from the Story and Paralogues, though they seem to have been tamed down or about the same as I did not notice many enemies with advanced skills. Blessed Gardens does introduce one additional rule that forces you to consider who you bring along: all four units must survive to win. Despite being somewhat of a series staple if you’ve ever hit the reset button in a Fire Emblem game, I have a love/hate relationship with it in Heroes. It brings back the challenge that most of the modes lack, but at the same time, I hate the way certain units are stacked with skills that can cripple most units in one turn. If you’ve ever done a Grand Hero Battle, you will know exactly what I mean, but that’s another discussion for another day. Blessed Gardens feels a lot more tame since it pulls existing maps, though the biggest challenge is deciding who to bless to permit entry into a specific garden. The great thing about both modes is there is incentive to keep playing. New maps are added each week and there are rewards upon first completion. Rival Domains mostly gives out tools for weapon refinement and other currency. Blessed Gardens gives out more Blessings to tackle the next Garden while some hand out 5 orbs for completing a specific map, as well as feathers and divine dew for weapon refinement. It’s a shame the good rewards come with the less interesting mode of the two added, but given the difficulty variation between each mode with Rival Domains being notably harder, it makes sense. What are your thoughts on the new modes? 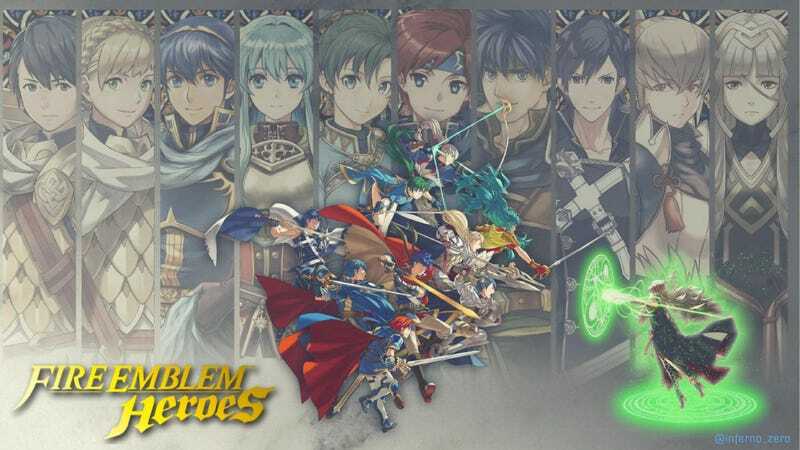 Would you be interested in seeing more coverage of Fire Emblem Heroes? As always, leave a comment and share your thoughts on the game in general.